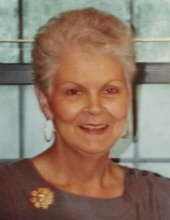 A graveside service for Hazel H. Cason, 79 of Cordele, will be held at 11:00 a.m. Saturday, April 13, 2019 at Bay Spring Baptist Church Cemetery. The family may be contacted at the residence of Lynn Spires at 889 Listonia Road, Cordele. Hazel passed away Thursday, April 11, 2019. She was preceded in death by her husband, Morris Cason and a son-in-law, George Liebno. Born in Norridgewock, ME, she was the daughter of the late James Elmer Haney and Susan Maria Hewes Haney. Hazel was a fulltime homemaker and stayed busy doing the things she loved which included her time loving and keeping her grandchildren and gardening. She especially enjoyed entertaining her family and cooking for them. She also enjoyed sewing and Bible Study and attended Pleasant View Baptist Church. Hazel is survived by her children and their spouses, Lynn Spires of Cordele, Meredith and Jim Drury of Valdosta, Daniel Spires, Jr. and Rosie Trejo of Douglas, Marti Spires Liebno of Valdosta, Tiffini and Brad Holland of Alaska and Felicia and Roger Pritchard of Dry Branch; a brother and sister, Leslie Haney of Manchester, CT and Meredith Vashon of Benton, ME; grandchildren and their spouses, Lee and Tina Barefoot, Daniel and Christy Mitchell, Kari and Chad Tabor, Jessi and Steven Glass, Jennifer Edalgo, Ron Edalgo, Kiara Trejo, Brianna Spires, Christina Spires, Daniella Spires and Robert and Ena Dare; and 19 great-grandchildren. To plant a tree in memory of Hazel H. Cason, please visit our Tribute Store. "Email Address" would like to share the life celebration of Hazel H. Cason. Click on the "link" to go to share a favorite memory or leave a condolence message for the family.